This process and system-related disconnect leads to lost sales opportunity, lower Gross Margin on Inventory Investment (GMROII), and lower customer satisfaction rates. 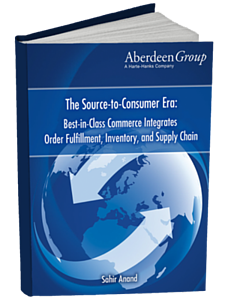 This Aberdeen Group Analyst Insight highlights the best practices of leading manufacturers and retailers that care about the integrated view of commerce-enabled order management, customer fulfillment, unified inventory, and balanced supply chain. It also provides strategic business process and technology recommendations so that industry followers can integrate all elements of commerce-enabled order-fulfillment and source-deliver processes, leading to greater market agility and lower Cost of Goods Sold (COGS). Complete the form on this page to receive the complimentary report.